Style/Shape: slightly-curled, leafy tea is comprised of a top grade, ‘two-leaves-and-a-bud’ pluck. Our Bai Hao has slender leaves and is comprised of nicely-shaped, twisted leaves with a little open leaf mixed-in. Appearance: top two leaves and a bud; slightly curled, strip-style shape. 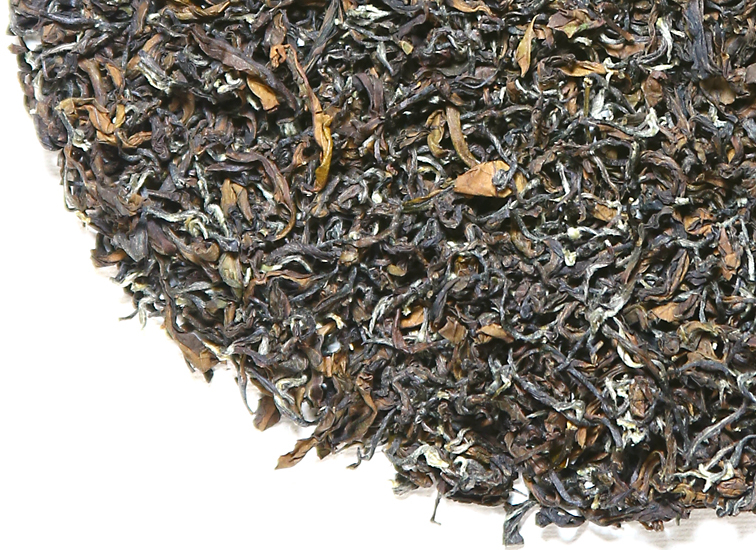 Bai Hao is unique among oolongs because of its degree of oxidation and leafy, un-roasted style. The leaf is a visually-pleasing mixture of textures and colors: dark and chestnut browns, some russets and golds, and plenty of characteristic white tip (visible buds). 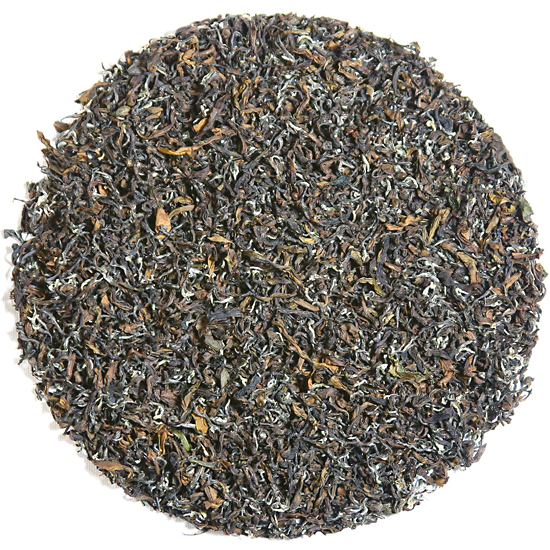 Flavor: Bai Hao is a mild tea – it has no grassy or green or floral or roasted flavors. It has absolutely no astringency. This tea is sweet and soft, suggestive of rich tastes such as chestnuts, apricots, peaches and honey. Aroma: the aroma has a slight suggestion of tree bark, forest mushrooms and biscuit. While oolongs are traditionally ‘rinsed’ before being steeped, Bao Hao and Baozhong do not require rinsing. This can be short (< one minute) or long (3-4 minutes). It is your preference. A little south and west of the capital city of Taipei, three tea growing counties – Taipei, Hsinchu and Maioli – produce Taiwan’s most famous oolong tea: Bai Hao. This tea is also known as ‘Oriental Beauty’. (This name should not be confused with ‘Bai Hao Yin Zhen’ – more commonly simply known as ‘Yin Zhen’ – which is a gorgeous, top-grade, bud-only white tea from Fujian Province, China). Taiwan’s Bai Hao oolong is the original, early-pluck, most-prized grade of the ‘White Tip’ family of Taiwan oolongs (it is similar to the blackbird/crow differentiation, in that Bai Hao is a White Tip oolong but not all White Tip oolongs are Bai Hao). For many decades White Tip oolong was sold generically as ‘Formosa Oolong’ in the West, whereas Bai Hao was reserved strictly for the domestic market (and limited sales in other parts of East Asia). It has always been and continues to be seemingly expensive; however, because it re-steeps very successfully, one can infuse an incredibly large amount of liquid tea from the leaf, so it is actually quite reasonable on a per-cup basis. Tea Trekker’s particular Bai Hao is made by the same tea farmer who also makes our stunning Baozhong. This requires very good tea-making skills and complete control of one’s processes, as Baozhong is the least oxidized of all oolongs and Bai Hao is the most oxidized. One tea could not be more different from the other. Our Bai Hao comes from a tea garden that has a very favorable location, receiving plenty of rain and frequent cool, ‘foggy’ conditions that are so beneficial to the health and vigor of the tea bushes. Bai Hao (and Baozhong, too) is a very unique oolong in taste and appearance. While some oolongs from Mainland China and Taiwan are semiball-rolled (and feature varying shades of green color and a greenish, sweetly vegetal taste), other oolongs are single, strip-style leaves that feature varying degrees of roasting and have a dark, earthy (or woods-y) taste. However, Bai Hao (and Baozhong, too) are unique among oolongs because they lie at the beginning and the end of the oxidation chart for oolongs. Their leafy, un-roasted style also gives them each a distinctive appearance. This lovely, slightly-curled, leafy oolong (Bai Hao) is comprised of a ‘top two leaves and a bud’ pluck. Our Bai Hao is hand-plucked – its slender appearance is comprised of nicely shaped, twisted leaves with a little open leaf mixed in. The leaf is a visually pleasing mixture of textures and colors: dark and chestnut browns, some russets and golds, and plenty of the characteristic white tip (visible buds). Bai Hao is a mild tea – it has no grassy, green, floral, or roasted flavors. And it has absolutely no astringency. The flavor is sweet and soft, suggestive of rich tastes such as chestnuts, apricots, peaches and honey. The aroma has a slight aroma of tree bark, mushroom and biscuit. The tea liquor is a medium, but deep-amber, color in the cup.